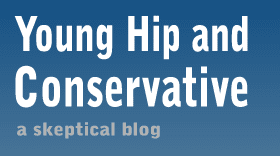 Young, Hip and Conservative: a skeptical blog: Can't we treat Islam the same as other religions? There's a lot of attention going to a Florida church that plans to burn a copy of the Quran on Sept. 11. I realize there is a lot of talk about how Americans treat Muslims today, and for good reason - there is a lot of anger being directed at innocent Muslims. However, Christians have been in that boat for as long as I can remember. Bible burning never gets this much attention, and a quick google search churns up tons of photographs and videos of the act. When trendy artists showed off a crucifix soaked in urine and a painting of the Virgin Mary stained with elephant dung, Christians were angry. They wrote letters to the editor, made lengthy speeches and boycotted art galleries. It's true that the anti-Muslim fervor in New York City recently lead a young man to stab a Muslim cab driver with the intention of murdering him simply for his faith. Mosques have also been the target of vandals. This is a terrible wave of hate crimes. But in fairness, so are the attacks on Mormon churches. Some members of the religion organized an anti-gay marriage campaign in California, so all Mormons are being held responsible by the vandals. A Mormon bishop was murdered a week ago, but it wasn't worthy of national news. Muslims deserve to be treated fairly in America. They are not below the other faiths, but they're not above them either. All I ask is that we treat them the same as any other religious group. Actually, both the AP and CNN had multiple articles covering the murder of Bishop Sannar. And just to be clear, I'm not sure you can connect the murder to the vandalism that occurred two years ago. The gunman was a former church member (though not of the same congregation) who was obviously very disturbed about something. Regardless, this is a terrible tragedy for Sannar's family and his congregation. You're right, I overstated my case. The attention of the Bishop murder was much smaller, but that's not non-existent. As for the motive of the gunman, that's right too - but that didn't come out right away. The normal media reaction of trying to link a random event to a popular one was not in full swing. Just a small correction, but Jyllands-Posten, the newspaper that published the cartoons, is Danish, not Dutch. Treating Islam the way we treat any other religion would be lovely, true. What do you think of events such as Everybody Draw Mohommed Day as a way to make criticism of Islam more acceptable? I hate to admit it, but I have been treating Danish and Dutch as interchangable for years. I don't think the goal of Everybody Draw Mohommed Day was to making it more acceptable to criticize Islam, I think of it as a way of as a counterattack that won't kill civilians. Actions like thwarting the UNs "Defamation of Religions Resolution" are much better at meeting that goal.